The Dockers scrape home. Nathan Fyfe was the star again with 31 disposals, 21 contested possessions, two goals and 11 clearancesthe fifth time this season Fyfe has recorded double figures for clearances. Aaron Sandilands hasn't had a disposal in the final quarter but has recorded eight hitouts-to-advantage after only recording six in the first three quarters. Nathan Fyfe leads the game in contested possessions with 21, the sixth time this season he has won more than 20 contested possessions in a game. The Dockers have had the last seven inside 50s for the match and have enjoyed 72 per cent time in forward half for the last 10 minutes. The Suns lead contested possession 17 to 11 for the quarter and lead this statistic 5343 in the second half. Fremantle is ranked No.1 in the AFL for kicking efficiency, going at 71 per cent by foot for the season. 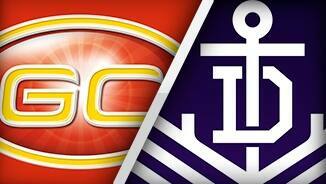 In this quarter, the Dockers are kicking at an efficiency of just 47 per cent, compared to Gold Coast's 70 per cent. 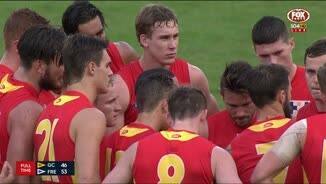 Gold Coast has made a promising start to the final quarter, enjoying 70 per cent time in forward half. Coming into today's game, Aaron Sandilands was averaging 13 hitouts-to-advantage per game, ranked No.1 amongst ruckmen to have played more than one game from 40 total hit-outs per game. Today he has 43 hit-outs, but just six have been to advantage. Nathan Fyfe has had an outstanding third quarter with 10 disposals at 90 per cent efficiency, seven contested possessions, two clearances and two goals. He has 23 disposals, 15 contested possessions and eight clearances for the match. The Suns have leveled up the clearances and the inside 50s this quarter. It has been six inside 50s apiece for both sides this quarter and Gold Coast only trails six to eight in clearances for the quarter. 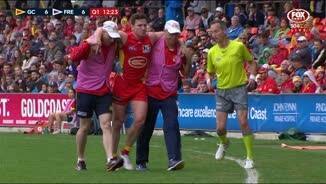 Gold Coast Suns InterchangeAdam Saad off due to an injury. Suns InterchangeAdam Saad off due to an injury. Fremantle InterchangeNick Suban was substituted into the game for Matt Taberner. The Suns have enjoyed 67 per cent time in forward half this quarter, after managing only 37 per cent time in forward half in the first half. Gold Coast's kicking efficiency has been a problem for them all season, kicking at just 60 per cent efficiency for the seasonranked 18th in the competition. Today, the Suns are kicking at 60 per cent, compared to the Dockers' 72 per cent. Suns InterchangeDanny Stanley off due to an injury. Welcome to Metricon Stadium for the Gold Coast Suns v Fremantle Round 11 clash. 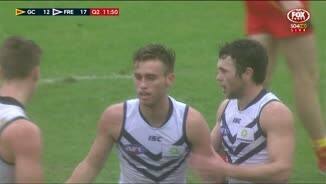 FREMANTLE has narrowly avoided a huge AFL upset, scraping home against a second-string Gold Coast at a dreary Metricon Stadium. The Suns incredibly came close to victory over the competition frontrunners, spending most of a pulsating final quarter trailing by less than a kick. But they were unable drag themselves over the line as the Dockers managed to hang on 6.17 (53) to 7.4 (46). In terms of ladder positions, a Suns victory would have been the biggest upset in the League's history. It came down to the final moments, as a low-scoring contest ended in a sudden flurry of goals. 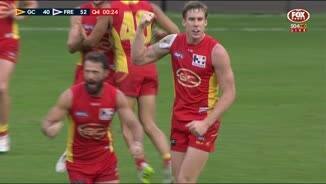 Nick Suban kicked what appeared to be the sealer with a minute to go from a free kick just metres out from goal, but the Suns kept coming and Tom Lynch provided an almost instant reply. In the end the Suns ran out of time but would have won plenty of admirers after a strong four-quarter performance supported by an even spread of contributors. 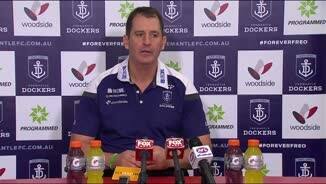 Relieved Fremantle coach Ross Lyon heaped praise on a hugely depleted young Suns outfit for their dogged determination in making life tough for the Dockers, who had the better of open play but failed to make it count. "We walk away with some frustrations today but they would have been greater if the scare had come true and we'd lost," Lyon said. "I think (the result) belies the general play dominance and entry dominance. "We couldn't quite capitalise, it was a difficult day, they had numbers back. 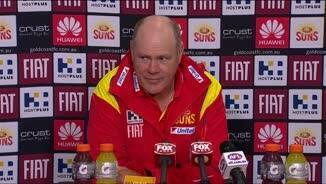 "Rodney Eade is a very good coach and he's very good at trying to equal things up when his team's an underdog." Predictions of a Freo bloodbath proved well off the mark, with the ladder leaders again a long way from their best - a week on from their first defeat of the season against Richmond. But Lyon said he would not dwell on the performance. "At the end of the day, we turn at the break 10-1, we get a week off (and will) come back pretty invigorated about the second half of the year," he said. 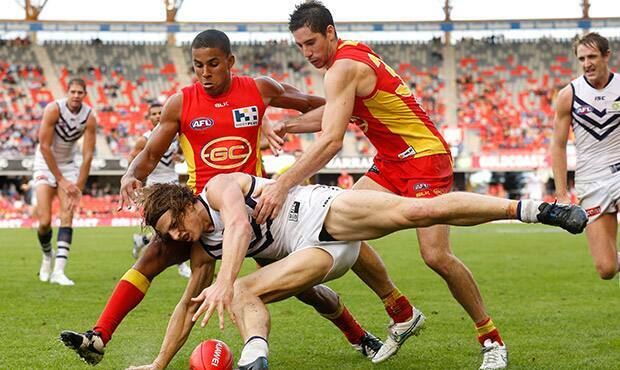 Most of Fremantle's failings were down to the Suns. Where they stumbled against Hawthorn and the Sydney Swans in the previous two rounds, Gold Coast was able to drag the game down to their level and stop Fremantle's damaging run-and-gun style. Eade said it felt like a watershed moment for his young group, who fell agonisingly short of a result that would have sent shockwaves through the competition. "I couldn't ask for any more from them to be honest," he said. "On the back of our last three weeks ... they've seen the light about where we're headed and what we're trying to achieve. "The weight of numbers, guys are buying in. "It's a corner and I think we've turned it but the trick is we don't want to go back around the corner." 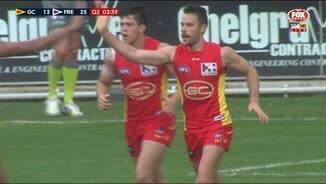 Acting captain Michael Rischitelli (17 touches) and boom rookie Adam Saad (20 touches) led the way for the Suns, who lost Danny Stanley to a knee injury early in the first quarter. The early diagnosis is that Stanley has strained his medial ligament and could be out for up to two months - but there is relief on the injury front with up to nine players set to be available after next week's bye. Nathan Fyfe was below his usual high standards but still amassed a game-high 31 possessions and booted two goals to finish as Fremantle's best. Ruckman Aaron Sandilands also had a day out with 71 hit-outs, breaking his own VFL/AFL record set a fortnight ago.